I got back from this year�s IBC to find a Facebook request from D.A. Foster waiting for me and I remember thinking, who the hell is D.A. Foster? His other friends were people I knew personally and I elected to accept his friend request. Fast forward to today and I realize that D.A. is a lot like another artist I love, Bettye Lavette, and his career is literally 35 years in the making. That time has served him well though, and the resulting disc, The Real Thing, is an amazing recording. Backing by the Phantom Blues Band with Tony Braunagel and Mike Finnigan in charge of production has enabled D.A. Foster to release a disc that should garner serious consideration for the Best New Artist category of the Blues Music Awards. This a good one folks, let�s give it a spin. The first thing I hear is Mike Finnigan on the B3 as D.A. tackles, �Good Man Bad Thing.� D.A.�s a good man in general but like all of us he made a mistake and we learn about it here. �Ain�t my way to start a fight�if your man won�t treat you right�.sit right down and tell him to�cause, that�s between the two of you�cause, I�m just a good man�who�s done a bad thing.� Sounds like D.A. caught her in a moment of weakness and is feeling guilty about the trouble it�s causing her now. Life happens and it�s time clear the air, regardless of the outcome. More horns fill the air and D.A. moves on to �Ain�t Doing Too Bad.� At the moment life is good and D.A.�s stock is on the upswing. �I don�t like work�. and work don�t like me�and we stay away from each other�that�s the way it should be�I ain�t doing too bad, baby�ain�t doing too bad at all.� We�re not exactly sure how D.A.�s making his money but he�s doing ok. The tempo slows down just a touch and D.A. tackles a Don Robey tune, �This Time I�m Gone For Good.� �I should have stayed gone�when I left before�cause you do me wrong�when we�re together�but I keep coming back�oh, Lord�for more.� D.A. has tried to leave this woman but her charms kept dragging him back in for more. He�s stronger now and she needs to know, �this time, I�m gone for good.� Let�s hope that�s the case for D.A.�s sake. So of course D.A. needs a new love and he�s telling the world that he�s a �Super Lover.� �I love you by letter�I�ll love you by telephone�I got might love�just like King Kong.� I love D.A.�s take of this Eddie Hinton tune and he�s definitely got the right attitude for the job. With playtime over, D.A. takes a more serious approach as he let�s the world know, �I Need A Good Woman Bad.� �Could it be this thing�that I�ve been in�don�t agree with me�I�m a lost man�. I need a good woman bad.� D.A.�s transitions are a thing of beauty and the synchronicity between he and the Phantom Blues Band is spot on. He�s had a long-term working friendship with Mike Finnigan and you can hear it in the performances found on this disc. More pounding on the pots and pans lead D.A. to our next cut, �Smack Dab in the Middle,� and that�s where D.A. is the happiest. �Ten Cadillacs�a diamond mill�. ten suits of clothes�to dress to kill�a 10 room house�some barbecue�and 50 chicks, not over 22�smack dab in the middle is where I need to be�so I can rock and roll my soul.� Sounds like the perfect place to be to me�smack dab in the middle. I�ve always been a fan of Bill Withers so I�m very happy that D.A. and the band tackle �You Just Can�t Smile It Away�. �You just can�t laugh it away�its just too deep inside�your feelings�oh, it�s love�not just some game you can play.� This is a serious love and definitely not one you can just �smile away.� Mike�s B3 makes an appearance and you can hear the passion in D.A.�s voice as he sings this tune. More B3 as the band moves on to �Lie To Me,� a Brook Benton tune. �I know�if I lose you�. then, I�ll lose my mind�so lie�lie�lie to me�. I�d rather have it that way.� D.A. knows his woman isn�t being faithful, but he can�t stand the thought of losing her completely. No one has confirmed his worse fears, it�s just a feeling that he has. �Gee Baby, Ain�t I Good to You,� finds D.A. at his most charming and the listener is taken way back in time to a different era. �What makes me treat you�the way that I do�gee baby�ain�t I good to you?� This is a classic tune for late in the evening and the band is just killing it behind D.A. The final cut is �Down Home Blues,� and D.A.�s spot on with his approach to this tune as well. �Do you mind if I get comfortable�and kick off both of these shoes�while you�re fixing me a drink�. play me some of those down home blues.� D.A.�s at home with the love of his life and she�s fixing to get down with �those down home blues.� Can�t think of anything much better than that. I�m feeling a tad of jealous of D.A. in the moment. 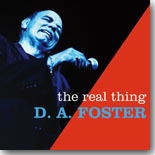 I�ve not gone deep into D.A.�s history here and I�ll leave that for you to explore on his website, dafostermusic.com. It�s an interesting backstory to a disc that will go down as one of the first gems of 2015. Working with the Phantom Blues Band and having Tony Braunagel and Mike Finnigan on the mixing board has allowed D.A. Foster to release his vocal talents on the Blues world in a fashion I�ve not heard in a long, long time. Kudos to everyone involved with this project, and I�m sure we�ll be hearing more from D.A. Foster before the year�s out. You can take that to the bank!